R.R. Street’s presented a $5,000 check to DLI’s School of Drycleaning Technology, December 13, 2017. From left to right: Kristen Vos, Director of Marketing for R.R. Street’s, DLI CEO Mary Scalco, Brian Johnson, DLI Director of Education & Training, and Michael Mills, Sales Director for R.R. Street’s. R.R. 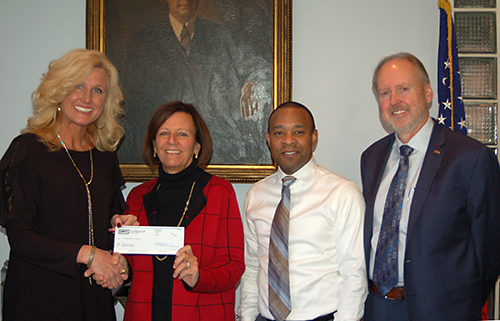 Street & Co. donated $5,000 to DLI’s School of Drycleaning Technology as the result of a promotional sale of one of its stain removal products. During the month of September every gallon of Collar Power sold by the company would include a $5 donation to the school. With 775 gallons sold, the company calculated a donation of $3,875. The company added $1,125 to bring the total to $5,000. “This money will be used for the school’s scholarship fund,” said Brian Johnson, DLI Director of Education & Analysis. “It was great to see a joint effort between DLI, our trade publications, our distributors, and Street’s to communicate and support this endeavor,” said Kristin Pos, R.R. Street’s Director of Marketing. During the promotion, Street’s ran an internal contest among sales representatives to reward the person who made the most sales. The winning representative sold 137 gallons of Collar Power and received a congratulatory plaque. R.R. Street’s began donating to DLI’s school in the 1960s and has been a steadfast supporter of the industry since before that time.